After some rehabilitation, your temporary disability is now healed but now you have some used handicapped equipment lying around the home. It is probably in excellent condition and tossing it away would feel wasteful. Rather than throw it away, you can donate the handicap equipment. Donated handicapped equipment can be a tax write off, save someone from paying full retail price, and help someone regain their independence. Where can I donate handicapped equipment? Try your local thrift shops. Go to your local hospital and ask them if you can get a tax deduction on your donated item. If they are not willing to accept, someone there should be able to suggest someone who will. 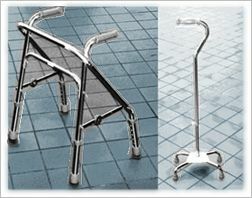 The American Medical Resources Foundation (AMRF) handles used handicapped equipment worldwide. Check your local emergency medical services (EMS) volunteers or a local social services department for people in need of such equipment. The Salvation Army, Goodwill and charities that work with medical equipment distribution are good spots. Veteran’s group homes are also good places to donate. Some equipment can be reused while others, cannot. Medical equipment must be sterilized before they can be reused. There are many legal ramifications that are involved when you donate used handicapped equipment. For example, there skin infections and other irritants that may transfer by reusing handicap equipment. This creates a liability that many people will not want to get involved even if it is operational. For these reasons, many companies and organizations not equipped to handle used handicap equipment, will reject your donations. Where can I get used handicapped equipment? The reason why most people get used handicapped equipment is because they are cheaper than the new versions. The simplest way would be to get it from a friend or relative. There are also organizations like Healthcare for the Homeless that might have some used equipment for you. The places where you can donate handicapped equipment are also the same places where you can purchase used handicapped equipment. If you feel a bit more adventurous, since many people throw away or sell expensive medical equipment online, there are sites like EBay, Freecycle and Craigslist. Make sure to set up a throw away email address because you can be inundated with spam and offers. Handicap walkers, crutches, wheelchairs and raised toilet seats are just a few examples of things you can find. Most importantly, used handicapped equipment has potential risks involved and there are no warranties. I do not recommend the used option but many people do reuse them.